The Wild Arms series set itself apart from other JRPGs with its American frontier aesthetic. Though these games belong entirely in the fantasy or steampunk genres of speculative fiction, they’re peppered with set pieces and environments lovingly recreated from a Sergio Leone film. Inns are replaced with saloons, legendary swords with six-shooters, shining armour with dusters and stetsons. The disconnected series takes place eons after the collapse of society, with a second industrial revolution fuelled by the rediscovery and re-engineering of lost technology. The first two Wild Arms games follow the adventures of lone gunmen gathering a party and adventuring against an evil machine god bent on destroying what’s left of the world. Familiar enough ground for JRPGs, but the third game departs in interesting ways relevant to my discussion of the group journey and cooperative mechanics. For starters, Wild Arms 3 does not add a dash of the old west to what is otherwise a fantasy setting: it drives it’s Western influence to its absolute extreme. The entire world is barren desert; even the oceans are massive bodies of moving quicksand. Where the first two games followed people fostering the recovery of a healing world, by the third, the planet is a broiled wasteland quietly drying out and dying. The game uses the “old west,” tradition—a form of storytelling deeply invested in individual triumph—to tell a story that is ultimately about groups struggling to survive in a world that, alone, they cannot. First, the game establishes and then subverts the key themes of the Western—machismo and manifest destiny—and then reinforces the theme of the group through its plot and mechanics in the context of a deconstructed Western. First of all, it’d be useful to discuss the tradition of the Western aesthetic at the core of Wild Arms 3. Western films have been made throughout the nineteenth century, reaching popular highs in the 1910’s and again in the 60’s and 70’s; instances of the written form go back farther. They’ve been filmed and set in the southwestern United States, the Australian outback, Mediterranean and Eastern Europe. Still, most Westerns focus on the southern states around the period of the American Civil War. Westerns have ballooned and plummeted in popularity and importance over the last century, while remaining quite consistent in their style and tone. The genre has roots in medieval chivalric tales, Japanese folklore and film noire, but its identity has crystallized into an immediately recognizable type of film. These films make frequent use of long shots, empty landscapes, sparse dialogue, hollow escalating small orchestra music and a dubious record of period accuracy. The hero is almost always a man, he’s taciturn, he’s mysterious, he keeps his personal history secret, he holds a rigid code of ethics that are unambiguously sympathetic—more recent and cynical western anti-heroes seek revenge or money, but at the very least the audience remains on their side—and he’s often opposed by native savages or criminals or (later) a large conglomerate or government represented by a ruthless thug abusing his institutional power. There have been some important changes in the genre from its silent film origin, pre- and post-war revivals and modern adaptations, but, as a genre, it’s kept its conventions fairly close to its heart. The Western is “about” the struggle of manliness in an increasingly effeminate world; it’s “about” escaping the industrialized world into the wild unknown and taming it for oneself. Of course, the central themes of machismo and manifest destiny make it potentially poisonous but it’s the way these films struggle with those problematic ideas that make them so intriguing. It’s also the way that Wild Arms 3 adopts these themes that makes it a fascinating game. The most obvious subversion of the Western comes in the character of Virginia. While the true hero of the story is the ensemble at large, it’s Virginia that graces the boxart and Virginia that represents the group in most the party’s interactions. It is also worth mentioning that her character model is unique in the Wild Arms series—and many games beyond it—in that she isn’t at all fetishized while still being incontrovertibly feminine. Her long pink frilled dress, while not practical, matches the aesthetic of her allies’ ponchos, belts, scarves, and waistcoats (many of which are equally impractical) without sexualizing her. Note that her pink dress and red bow—ostensibly “girly” design choices—are punctuated by the large gunbelt anchoring her outfit. Her belt and heavy hiking boots (the only brown articles she’s wearing) are equally prominent to her dress and bow: she is as much a fashionable girl about town as she is an adventuring gunslinger. Her design retains clearly feminine features because her position in the party is a celebration of her femininity for its own sake, which flies in the face of the Western’s tradition. More importantly, however, is that Virginia volunteers to speak on behalf of the party in most encounters with NPCs. For the game to make her ambassador for the group in a genre that so greatly values the masculine is significant. She may be as skilled in gunplay as her fellows, but it’s her feminine traits that bring a new dimension to the game as a Western. Women in Westerns are some permutation of noble savages, wives, whores, or oblivious aliens from eastern cities. Virginia is none of those things. When the player meets her in the prologue, she’s recovering her town’s treasures from a bandits’ den. Granted, her transition from townie to drifter takes time but her success is absolute and it comes in large part from her femininity. Virginia brings the group together in the first place and she keeps them together when they’re pressed. As the invaluable Mattie Brice has written about Final Fantasy XIII’s Vanille, “Sometimes the strongest character is the person who ties everyone together, is the subliminal, caretaking force that gives everything meaning.” (“Valuing the Feminine: Why I Love Vanille”. February 27, 2012. The Border House). So it is with Virginia who is given the highly gendered role of the “heart” of the group. It’s Virginia’s “subliminal, caretaking force,” that is often responsible for the party’s progress. Gallows is too confrontational, Jet too callous, Clive too insecure to manage conversation. It falls on Virginia to introduce the party and negotiate their way through society. Keep in mind that this is a world that is hastily dying and survival in the wasteland depends on the resources and skills of others: for Virginia to be the only one able and willing to make the personal connections that acquire them is monumental. The game does more than subvert the Western through Virginia, though. It also deals with another notion important to Westerns, that of independence from an expanding society. For one, there is no industrialized world in Wild Arms 3, there are only a handful of skeletal towns and a patchwork of railroads connecting them. Otherwise the whole world is an arid void. There is no rapidly expanding empire nipping at the drifters’ heels: there is no freedom to find, only isolation. A feature of the game that was highly criticized when it was released was its world-map exploration. New locations were not visible from the world map; to enter a location for the first time, the player had to be standing near it and press a “search” button, which would either uncover a location or attract nearby enemies. Once discovered, an area could be seen and entered at any time, but tracking down an unvisited town or dungeon was time-consuming, frustrating and dangerous. Setting out into the wilderness was risk that, if attempted without proper preparation, would guarantee a game over. The player had to track down NPCs to gather hints about where the next town was or where the next dungeon led. It made the player dependant on the people living in the sparse civilizations around the world. If the player gave up and looked online for a map than it was doubly effective, because the game then reached out of the screen and influenced real human behaviour: the player is seeking help from another person that has already accomplished what they are trying to. The player is always dependant on some outside help, even while mimicking the rugged individual of Western mythology. Thus, the game recreates the setting of a Western film and subverts it in the way that it celebrates feminine characteristics and demands that the player depend on other people to survive the individualist fantasy. In that context of a subverted Western, the game then structures itself around group cooperation*. As mentioned earlier, the game’s real protagonist is the playable party of four. The game begins in an excellent combination of tutorial, style and character introduction. All four members of the party—at this point strangers—are aboard a train (that symbol of American expansion), when loud crash from the cargo car startles them. They separately sneak into the cargo car and, each suspecting the others of causing the noise, draw their weapons on one another. The camera freezes. The player selects one character after another to play through the circumstances that brought them to the train while learning the game. After each character is introduced, their standoff resumes, only to be interrupted by a trio of bandits. The party joins up to fight off the bandits and, afterwards, never leave one another’s company. Though their alliance is originally a reluctant one, their seemingly accidental meeting drives the arc of each character. Importantly, most of their individual personality traits don’t change very much throughout the game; rather they each learn to apply who they are to a functioning group. Virginia remains optimistic, Gallows remains rebellious, Jet remains stoic and Clive remains objective. Their real evolution comes in how they learn to collaborate to achieve common goals. The game’s mechanics illustrate how the characters are required to improve and grow as one. A massive aversion of the typical band. The Chick is also The Leader, The Lancer is the actual The Chick, that The Big Guy is the best mage in the party with the worst melee attacks, and The Smart Guy is a Mighty Glacier with a sniper rifle…It gets to where one suspects the party’s design is an intentional complex Deconstruction of the usual personality-to-party-role stereotypes in your average RPG. This indicates an interconnectedness between members of the party. The members of the party, certainly all individuals, don’t fit cleanly into the roles one would expect, and must therefore combine their strengths to create an effective party. Each combat role must be filled for combat to flow smoothly, but, with only four characters, there is no room for hard class lines. As a result, characters have to support one another and they frequently have to break from their most competent role to do so. Furthermore, there are a number of variations to combat where each individual must excel as a fragment of the group. There are several different vehicles that the party will gain access to and random encounters still occur when piloting them. Each party member will man a different part of the vehicle, one will helm the craft, another will operate the main gun and so on. Each character’s stats will determine the effectiveness of each function of the vehicle. Thus, the vehicle is not an inert piece of machinery. Instead, the operator of each separate device on the machine determines the vehicle’s overall capabilities. Moreover, that the party shares HP in these situations further illustrates that the group succeeds or fails together as a unit, not as a dumb collection of disorganized personalities. The group’s interdependence, however, shines through most apparently in the exploration segments of the game. The player can freely swap out which party member will be guiding the party at any time, choosing which character will roam the world on the party’s behalf—which will be the “body” of the party. However, while the fact that the game does not default on which character will roam for the party suggests an equality among its members, which character the player controls changes how they are able to explore the game. Each character carries three unique tools that are necessary to solve the game’s puzzles. These tools interact with puzzle and platforming objects that unlock paths through the game. Without access to each tool carried by each team member, exploration would not be possible. Therefore, traversing the game can only be done by the cooperating group, not by a single member of that group. 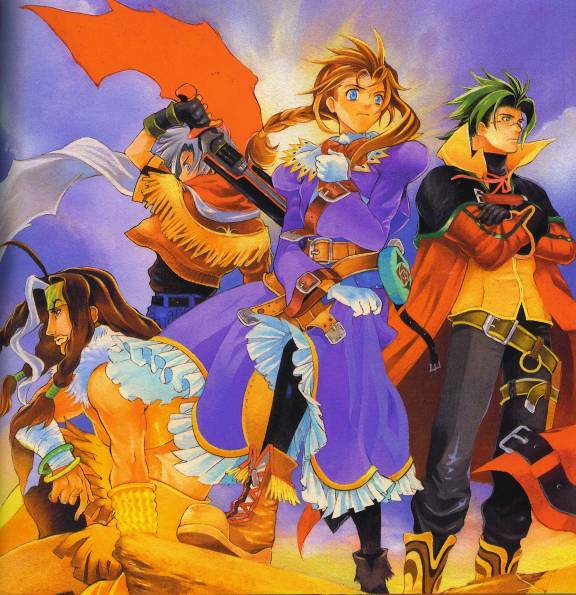 Wild Arms 3 demonstrates a number narrative and mechanical qualities that emphasize cooperation over individualism. But what makes it such a compelling game is that it does so while being a critical homage to the Western, a genre that is built upon distrust of the other and faith in personal exceptionalism. The game successfully hollows out the harmful conventions of the Western and replaces them with the cooperative mechanics and story devices of the JRPG ensemble. * Many Westerns, especially those filmed prior to the Second World War, are notoriously racist. The genre romanticizes Eighteenth century America, even though the genocide of Native Americans, the marginalization of Mexicans, the indentured servitude of east Asian immigrants and the commodification of African slaves were simultaneously ongoing in this period. The Western either demonizes or silences these peoples to champion the virile, white, independent man. Wild Arms 3‘s greatest failure is that it does not subvert this harmful trope even when it has plenty of opportunity and reason to do so. Further reading: Cidolfas. “Wild Arms 3.” The Role-Playing Jew. July 16 2010. Asplund, Andrew. “Campaign Settings: The Western Environment.” Tales from the Gamer Viceroy. Aug 8 2013. Kylie. “The Game No One Ever Heard About.” Backward Compatible. Nov 11 2013. Caskie, Chris. “Exemplary Openings: Wild Arms – A Promise of Adventure.” Chris’s Save Point. Oct 31 2009.